Just when I thought I heard everything under the sun, here comes Van Canto. This six member band sings a cappella metal. With the exception of drums, all parts are done vocally. There is no bass, keyboards, and, if you can believe it, no lead guitar. All guitar solos are handled by one member or another of Van Canto. And, to be honest, I liked it: this is pretty clever stuff. All vocalist have exceptional range and skill. This is a unique work, and so I give it high marks. Previously, Van Canto covered the Metallica classic 'Battery' on their 2007 'A Storm To Come' work. On 'Hero' they cover a wide range of metal including Manowar's 'Kings Of Metal,' Iron Maiden's 'Fear Of The Dark,' Nightwish's classic 'Wishmaster,' Deep Purple's 'Stormbringer' and Blind Guardian's 'A Bard's Song.' The last song is appropriate because Van Canto recorded 'Hero' at Blind Guardian's Twilight Hall Studios and BG singer Hansi K�rsch is guest vocalist on 'Take To The Sky.' 'Wishmaster' was a perfect choice allowing Inga Scharf (and Van Canto) to celebrate the ongoing rise of female metal vocalists. As for the other covers, 'Kings Of Metal' kills and should make Manowar proud. 'Stormbringer' sounds so good I got shivers down my spine. And what they do with 'Fear Of The Dark' is simply fascinating. I still find it difficult to believe that they use no guitars for the solos. It simply sounds so natural. Van Canto's 'Hero' was a pleasant and appealing surprise. I'm quite sure some will find a cappella metal bizarre, cheesy or simply unnecessary. However, I thoroughly enjoyed this unique take on heavy metal. This is much like Apocalyptica playing Metallica on cellos: unique, innovative and enjoyable. Very recommended! 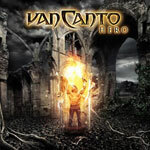 Van Canto's 'Hero' was a pleasant and appealing surprise. I'm quite sure some will find a cappella metal bizarre, cheesy or simply unnecessary. However, I thoroughly enjoyed this unique take on heavy metal. This is much like Apocalyptica playing Metallica on cellos: unique, innovative and enjoyable.